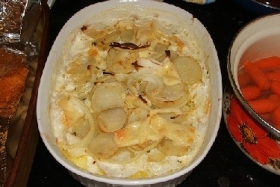 Have you made Boursin Potato Gratin? 1. Generously butter a 13x9x2 - inch baking dish. 2. In a heavy 1-1/2 quart saucepan, heat cream, Boursin cheese, shallots and garlic over medium heat, stirring until cheese melts. 3. Preheat oven to 400 degrees. 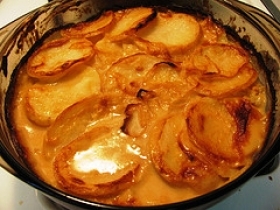 Arrange half of the potatoes in the baking dish in slightly overlapping rows. 4. Generously season with salt and pepper. Pour half of the cheese mixture over the potatoes. 5. Sprinkle with the chives. Repeat layering with the remaining potato slices, more salt and pepper, and cheese mixture. 6. 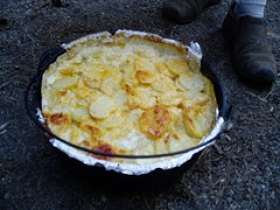 Bake uncovered one hour until potatoes are tender and top is golden brown and moist. 7. Check at forty five minutes. Do not over cook. 8. Sprinkle with parsley. Makes 8 to 10 servings. 9. Absolutely to die for! LEFTOVERS, IF ANY, FREEZE BEAUTIFULLY. 10. I put in refrigerator, and when cold and "set up" simply cut into individual sized servings, lift out of container with spatula or egg turner and put into zip lock bags or wrap in plastic and freeze until needed. 11. 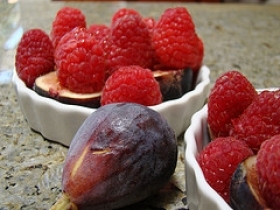 This way you can get out one serving, or many as you want, without having to defrost entire amount for a small portion. 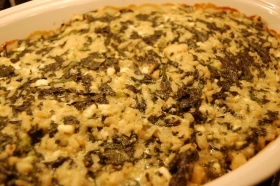 This recipe contains potential food allergens and will effect people with Potato, Garlic allergies.